Our newest skin treatment at our SPA is the SkinPen. The skin pen has been clinically proven to reduce the appearance of scars, pits and skin damage. There is little to no downtime, its effective for all skin types. It’s a short procedure that is non-invasive, can make the skin look like new in as little as 3-5 treatments. Our Perfect Derma™ Peel improves the overall clarity, tone and texture of the skin. It reduces or eliminates hyperpigmentation, sun damage and melasma. it also improves acneic skin conditions while reducing acne scars. The peel stimulates the production of collagen and reduces the appearance of pore size, resulting in firmer, more youthful skin. Watch the video and learn more about the treatment here. This iS Clinical® treatment combines papaya and pineapple enzymes with a potent, clinical-level grade glycolic acid, producing a luxurious foaming activity. Meanwhile, bioactive ingredients exfoliate and deeply cleanse the pores. This facial treatment is a great solution for those with acneic, aging and/or oily skin. Check it out here. The nationally-acclaimed HydraFacial MD® treatment is a non-invasive skin resurfacing procedure that cleanses, exfoliates and hydrates skin. It can be performed on the face, back, lips, neck and décolleté and hands and forearms and delivers instant results with no discomfort or downtime. 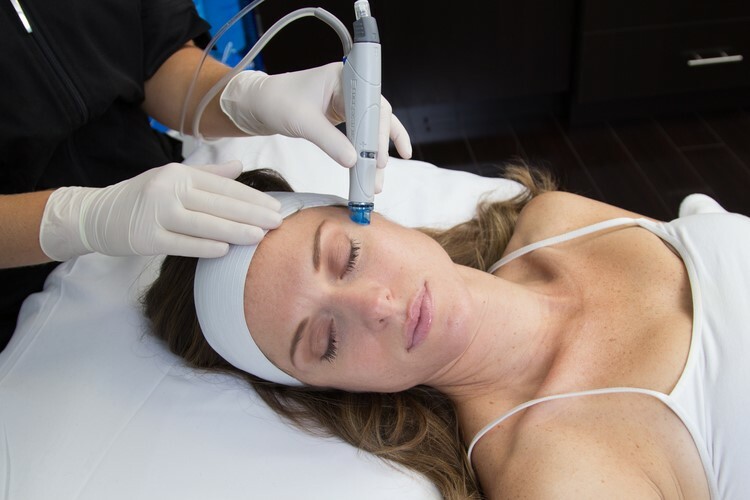 The HydraFacial MD® evolved from its "older cousin," microdermabrasian, which is another non-surgical process that removes the skin's outer layer by using a stream of micro-crystals blasted onto the surface on the skin. The difference is that the HydraFacial doesn't use crystals in the exfoliation process. Instead, it uses a specially-shaped spiral tip which exfoliates and removes impurities, similar to manual extractions. It also applies various serums that cleanse, hydrate, and infuse antioxidants into the skin. Facials can be helpful in creating and maintaining clear skin. Facials cleanse the pores and remove impurities in the skin. The extraction is done to get rid of whiteheads and blackheads, which clog the pores. Keeping a regular facial regimen will help you steer clear of future breakouts. While facials can help, please note that the results may vary depending on your skin type, the type of acne you have, severity of your acne, and the type of products you use to treat acne. Before starting any treatment, it is best to consult with your esthetician. If you decide to make facials a part of your skin care routine, opt for a gentle, calming facial that doesn’t introduce facial massage. Why? It’s because facial massage encourages your skin to be active, including the oil glands. Facials should be done regularly. A single facial won’t accomplish everything. You’ll have to commit to a series of facials, preferably once a week or once every other week, to keep those unwanted breakouts away. Is an acne facial for you? Facials can be an effective way of getting rid of blackheads and whiteheads. However, not all cases of acne can be treated by facials. Acne facial is a great option for you if you are struggling with mild acne. But if you have moderate to severe acne, facials are probably not a good idea. Extracting inflammatory acne can be very challenging. When done improperly, it can lead to further inflammation or scarring. Also, exfoliants can irritate pimples, causing them to become more inflamed. If you suffer from acne, acne scarring, large pore, oily skin or deep pits, contact our SPA and we can get you on a treatment regimen to improve the health, look, and beauty of your natural skin.